There are a few competing theories about credit and debt, all of which relate to the topics of money, exchange, value and markets. There's the "credit theory of money", the notion that credit is an accounting system that functions to facilitate exchange. This theory can describe virtual credit systems and explain the emergence and function of money in the physical form, at least partially. The "state theory of money" is the notion that the government issues credit, collects debts and standardizes currency within a state on the basis that such a process is in its authority. Historically most governments were privileged by religious institutions to issue credit and collect debts for "the gods", ie the "primordial debt theory". However, the authority of the government in the US, for example, is becoming increasingly secular with psuedo-scientific institutions, ie university systems, media and general cultural reproduction apparatus, justifying the technocracy that stabilizes the larger ruling class. In fact, ever since the Enlightenment it appears God has become a less prominent idea, and the Church a less important institution, in stabilizing the privilege of the State. Today it's debatable if those modern scientific institutions aren't dogmatic or religious in some aspect but I digress. If this at all sounds like a regurgitation of David Graeber's "Debt: The First 5000 Years", I have brought up the three theories and some of the economic history outlined in his book, but I ultimately formulate a constructive theory while he tends towards a critical theory. Finally, there is the "money theory of credit" which is the idea that money is a store of value, not an accounting system or facilitator of exchange, and is essentially rooted in the classical liberal/libertarian capitalist notion of credit because this store of value is often thought to have historically emerged out of barter systems. In reality barter systems did not evolve into physical monetary systems of exchange, rather virtual credit lead to money that was at the same time being standardized by governments. The money theory of credit is ultimately compatible with, in contradiction to its own logic, both the state theory of money and the credit theory of money since the facilitator of exchange was modified by the state to store value for the ruling class. This reveals the classical political economists and Austrians "money theory of credit" maintains deep historical ties with the state, not just the market, and that the theory maintains practices capable of developing capitalist formations that by sanction of property manage to constitute and structurally reinforce the governmental state which over the last two centuries of capitalism has intensified class antagonisms. In combination these four theories are a great scientific explanation of how social matters have gone wrong, how most of our debt problems have emerged, but lacks a clear solution of how to move forward without recreating those same mistakes. Neo-Proudhonians theorize credit as functioning as a facilitator of mutual exchange, therefore I'm proposing a particular "mutualist theory of credit" or "mutual credit theory of money" that has practical implications for both virtual credit systems and monetary systems in order that such systems may approximate liberty, equality, and freedom. Therefore the mutualist theory of credit is a type of credit theory of money, if money is to be specifically addressed. In a political, social and economic sense a mutualist theory of credit proposes that credit is generally acquired in society by 1) engaging in mutual conventions of exchange, 2) exerting productive labor in workers associations, 3) maintaining ecologically conscious productive methods, and 4) approximating justice in appropriation and respecting others proprietorship under norms of occupancy and use. Debt is acquired in society by violating any of the listed social dimensions, or borrowing credit from a creditor in the case of money, and while credit may be acquired by ethically engaging these listed institutions, debt is not imposed by failing to acquire credit, even if acquiring debts will often cause one to lose credit. There is an antinomic relation between creditor and debtor, so neither can be positioned as absolute without threatening that very system. Debt carries obligation, but that obligation is not absolute, otherwise the creditor would cease to practically emerge, liquidity would diminish, and the most essential property of any credit system, ie facilitation of exchange as a reinforcing convention of production, would cease to exist. There is a risk of supplying credit due to the reality that debts may not be paid, and since that risk is not taken to enrich the creditor alone, because that would indicate a practice in storing value, credit must function to enrich the association, both creditor and debtor, hence mutual credit. A debtor is often provided with the opportunity to make good on an arrangement, whether that involves empowering the association both creditor/debtor is a part of, or the associations the debtor maintains in order to acquire the proceeds to remunerate the creditor by extension, but either way this theoretically serves to empower all. The credit eventually acquired by the debtor doesn't come at the cost of the creditor if we figure the debtor is making good on his arrangement and remunerating the creditor. However, debt defaults while coming at the cost to the creditor doesn't threaten the very institution in particular, in fact the risk of loss is what makes credit systems function and if loss doesn't exist then neither does the risk of loss. The accumulation of debt from its absolution is detrimental even to creditors, considering that the credit of another can only help the creditor in the long-run, so if a system becomes vulnerable to a spiraling state of debt, as we're experiencing with many of our global financial institutions, then complete debt cancellation and/or disbanding of the larger structure of credit associations is generally the best thing to do. This may alternatively imply or require the construction of mutual credit institutions as a form of gradualism, dual sovereignty, or counter-economics. Making absolute debt obligations for the debtor would create a tendency towards poverty for everyone in the relationship. 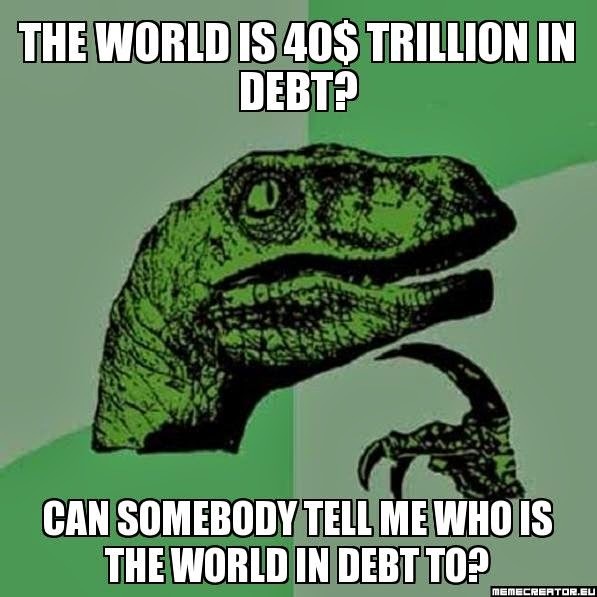 If the creditor was absolute in their institutional role then credit would become worthless since it would provide no incentive to be credible, therefore resulting in arbitrary externalization of debt obligations on others for their own failures, after all there's no such thing as a free lunch someone has to pay for it. Absolute credit and debt eventually crystallizes master-slave relationships, ie authority from credit acquisition and slavery from debt obligation. Credit and debt must fluctuate according to the development of ones being, and since no person or groups law of organization is fixed, there must be equilibrium according to the principles of reciprocity and progress. Virtual credit systems don't always have the role of lender and borrower per se, credit and debt are often shared by association of accountancy, like credit clearing systems, rather than involving exchanges of physical money. A tab system often involves a form of virtual credit where there is a lender and a borrow but conventionally this accountancy system requires payment by means of physical money, so it's both virtual and physical. Time banks are a type of mutual bank and usually involves a currency securitized by labor-time, as physical notes made legitimate by trust in the convention of the association, or simple accountancy system that records IOU's which are legitimized by that same sort of trust. LETS (local exchange trading system) are virtual credit clearing systems that don't generally require physical money at all but are nonetheless potentially mutual credit systems and generally have a record of balances. The kinds of mechanisms involved in these associations vary, anyone engaging in unethical practices may be disassociated by means of blacklisting, and currency may be either entirely virtual according to measurable dimensions of labor-time, quality of labor, etc or physical in the form of fiat notes or commodities that's value is reflective of labor costs. Lending physical money at cost-price accounting for time-preference, absent of interest or usury, doesn't necessarily put the lender in debt because they are taking the risk of the borrower defaulting on payment, and even though it's possible they may lose their sum of money by default, whether or not they receive remuneration for their opportunity cost rooted in productive labor, by taking that risk to empower someone else they may be developing their own credit. Physical money has dual-value as a commodity in itself, and as a medium of exchange, so it's hard to determine its true cost in order to avoid the conflation of time-preference with interest, or conflation of interest with both time-preference and administration costs as labor costs in the case of a credit union, but since no one can determine the costs of others provided that labor is valued subjectively, there has to be a level of trust over valuation since credit unions require trust. The credit unions that operate in conventional society are usually subject to government regulation and monetary standardization, so they're not the most trustworthy or best examples of mutual credit since they tend to emulate capitalist management schemes, but they are approximate improvements compared to blatantly capitalist institutions and always have the potential for progress with more ethical involvement with its democratic processes that function as a counter-weight to managerial interests sanctioned by the law of the governmental state. It seems equilibrium between credit and debt would be the tendency in any society, indicating a sort of reciprocity or tendency of equality in credit and debt of each and between all, if false theories of state wouldn't transform relations of credit and debt to promote the social disequilibrium that subsequently results in a permanent class of debt slaves, generally the working classes, which ironically enough have done more than any other class to acquire credit by performing the four listed social functions I described earlier. This disequilibrium is our current problem since the global debt of the world amounts to something like fourty trillion dollars, but there's no explanation as to where this debt has emerged if in fact we are all a part of "the state", "the market", "the gods", and not separate from and somehow in debt to said collectivities that we compose. This mutualist theory of credit is a type of credit theory of money and is potentially a "state theory of money" if the state is a practical and conscious manifestation of self-government as a social being which doesn't constitute a centralist, hierarchical or monopolistic state. False theories of state throughout history can serve to explain the serious accumulations of debt that have subsidized capitalism, just as a absolute theory of property can serve to create institutions of hierarchy in a state that requires corrupted monetary systems to maintain the privilege that a government may grant with its legal authority. Either way this theory is not a "money theory of credit". I advocate mutual credit systems as the practical basis for any monetary system because coinage and physical currency can only be mutual if it's appropriate in a particular context, and furthermore whether it is monetary or virtual it cannot be made legible to a governmental authority otherwise it can be either standardized, regulated, and manipulated to systemically privilege with stored value those who emulate capitalist conventions of exchange and forms of production that best fits the morality of a governmental authority. This credit system must be in the morality of self-government as an anarchic social being, in opposition to the governmental principle of the state as a monopoly on violent force, this false principle of an external constitution of social power that is the State. Here I have a list of neo-proudhonian theories which I am going to dedicate a paper to each. I can't promise that I'll finish it quickly but it will get done. My friend David over at the "Blazing Truth" blog posted "A New Mutualist Manifesto" that definitely has some good work in there. Give it a read. The first link explains why the collective consciousness of humanity is not ready to abandon the concept of property, and that rather than ignoring the matter we should rather update the theory of property and move forward. Private property initially aimed and actually served to reward the laborer with his product. Unfortunately as industrial capitalism developed the theory of non-Proviso Lockeanism (the historically theoretical background for most legalistic forms of private property) essentially failed to account for the particularly destructive material relations and exploitative social forms of industrialism and is how the revolutionary aims of private property were eventually dialectically inverted to instead divorce the laborer from his product. Since the development of industrial capitalism neither the complete theory of Proudhon or Locke (Proviso Lockeanism) have been practiced, and I believe it's safe to say that both theories would have positive social and ecological implications especially within the context of global corporate capitalism. The second link beautifully ties together the intersection of both Proudhon, Stirner, and Locke's theories of property. Locke's Proviso's are likely the emergent norms of Proudhon's theory, the norms that Stirner considered somewhat unnecessary for a "Union of Egoists" and Proudhon left to persons practicing of reciprocity or the Golden Rule. The state is not the only socio-political institution that has created the "subsidy of history" (1) that is to blame for the current economic structure of society, as many left-libertarians argue. Private property is an institution that has as much dirt on its name as the state since conventional property norms promote "privatization" over social realms as opposed to what is falsely conveyed by politicians, corporate media, capitalist proprietors, and managers as individual ownership involving purely individual concerns and responsibilities. Private property has historically and existentially dictated the movement has created an inproportionat amount of exclusive control over material, principles, rights, and general institutions and consequently is what defines and reinforces the state since the state defines the institution of property (or that’s what they would prefer us to have us think) in the form of legal right (even though moral right is something different). The relation between state and private property implies deviation and a degree of independence among them. This means institutional analysis should focus on them both in relation and isolation. I will focus on the relation and implied deviation between these institutions. Due to the fact that state and private property are two territorial monopolies on force that overlap in principle there exists a contradiction and inherent antagonism in practice that can only be resolved if those who control the institutions (via the hierarchies within the organizations that the institutions have formed) concede each other a given amount of autonomy over what their classes control thereby legitimizing their roles in society. This way the relative but conflicting functions of private property and state don't contradict each other in a mutually detrimental way since there exists the potential that politicians, managers and proprietors of the ruling class work against each other at times. However, their net cooperation as a class will exceed their net conflict if said structures manage to effectively synchronize, otherwise the ruling class wouldn't be coherent enough to justify their own institutions and they definitely don't want that. Hopefully the current lack of structural synchronicity is what destabilizes the ruling class in this process of globalization, but our efforts to consciously approximate reciprocity within and beyond the system that exists definitely wouldn't hurt, in fact it would insure a way forward for those engaged at least if not insure a true end to this oppressive system on increasing scales or dimensions at best. Either way their cooperation as a coherent ruling class essentially externalizes their antagonistic social forces onto the public by means of only letting each other share their exclusive domain in the name of preserving their institutions and its failures which are associated benefits for them. Even though though these institutions manage to deviate they are currently necessary for each others existence. Private property contributes to the definition of a state in the sense that what the state has a territorial monopoly over is constituted by many things including what the institution of property happens to maintain control over. Private property operates somewhat independently from the state, but usually in benefit thereof because the manifested centralization of private property, by means of capitalist appropriation and the resulting yields from unequal exchange that reinforces *future* capitalist appropriation, makes private property more legible for the state to control. The state also functions to benefit the proprietors of the ruling class. Every time the state constructs a law, regulation, tax, or subsidy it is essentially drawing lines on where and how state property in its various forms is "justly" distributed among "us", or more realistically the elite. Furthermore any manifestation of property in the hands of a given class over a given industry has more say in the operation and decision making of the state than any non-proprietor, making the state as much a proprietary entity as proprietary entities are mini-states. This is not to say that we ought to seek the power of the state, since its principle invalid and its aims unethical, but that's how it currently works. This property-state antinomy needs to be confronted, but blaming the state for everything that existing private property has also contributed to is disingenuous and is not a way to confront it. Realizing what the state has done is one thing but reducing every social problem to the state is something completely different and ends up aiding the problem. While the state has often historically defined the institution of property within its legal constructs, property theoretically can and historically has formed as a counter-institution in negation to the state in practice, not only as simple deviation deviation but as social revolution. Therefore the solution to the property-state antinomy is to construct reciprocal property norms that negates private property and the state. "And property necessarily finds itself defined in these terms: The possession and use of an object to satisfy a need. Suppress the word possession, and property disappears. Suppress the word use, and property becomes an immoral, anti-human thing: it is monopoly; it is theft." The suppression of use as justification of a moral right amounts to the property we have today, and it surely is monopoly and theft. The suppression of possession would cause property to disappear, as Jules Leroux claims, but in my mind amounts to nearly as anti-human a thing as we have today because without possession (that control and law of organization extended by our personality) use becomes negated for the worst. The answer appears to approximate a property form established by an ethic that embraces possession on a basis of occupancy and use in contexts appropriately correspondent to individualism (private life) and socialism (social contexts), ie reciprocity. This way property as it "necessarily finds itself defined" can be realized. We must realize that the state is playing an increasingly expansive and important role in the survival of capitalism (which is probably why this tendency of anti-state reductionism has emerged, ie blind reaction to a police state, surveilance state, etc) because it is suffering from constant crises and increasing risk of collapse that’s been inherent to the internal logic of private property from the beginning (legitimization crises, input crises, fiscal crises, over-accumulation/over-production/over-population crises). Furthermore in the last one-hundred years or so, with the development of corporate and global corporate capitalism from the initial mercantile and industrial capitalist interests, the state as a political institution has served to both increasingly rationalize and preserve these economic contradictions to the extent that the system doesn't collapse or that the people revolt, which is a sign that capitalism in general is running out of time, space and energy because the state is a principle of persistence in a reality of constant change (2) (state stems from the word "stare" or to persist). This is why the state as a principle is invalid, and why the state is serving to stall the decay of capitalism when we obviously should just move on. Property as a legal right and moral right contradict. The conscious realization of property as a fact, or as a complex matrix of "ownness", and the justification of property as a socially or individually exclusive moral right in correspondance to reciprocity (as the principle that describes this matrix of "ownness" and prescribes respect for "ownness" where groups and individuals identify and justify their "own" in this matrix) should approximately establish us on a road towards alternative actions and institutions that will practically dissolve private property relations in social contexts, establish personal property that's not unjustly appropriated, and the promote the active emergence of social property in social contexts. This revolution in property ought to promote the very resolution of the economic contradictions (since a counter-economy will coalesce around these altnerative/counter-institutions) that helped promote the false necessity for a state to "reconcile" such contradictions by its principled illusion of persistence and in turn its actual forces of taxation, regulation, subsidization, and legalization. This will eventually form a “counter-weight”, just as Proudhon said, to the state itself. In essence, constructing a reciprocal property norms among ourselves can dissolve private property and the existing state, giving us a chance to educate against any state from ever re-emerging. In terms of strategy we ought not focus our energy entirely on the state in a direct manner, but that which defines the state, ie private property, even if we oppose both equally. Directly confronting the state will just get you hurt, and the most ethical and strategic manner to get rid of your masters is to cut the leash, not bite the hand. If you detach yourself from private property as a social institution, that which defines the state, by means of constructing our own reciprocal property norms, that leash that permits the accumulation of private property (in material, intellect, organization) which is essentially extracted from the social realms that reinforces your *own* private life will disappear, and so will the state as it no longer has that leash to rely on. However this can only occur by the approximate proccess of learning how and proving we can care for ourselves through means of prefigurative politics guided by sound ethics and principles, then a successful dual-power can form.